This is the new LawMate RD-30, pocket-sized counter surveillance tool with both wired and wireless camera detection modes. 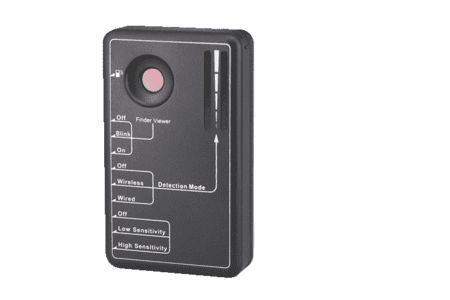 This system uses the same technology as the popular RD-10 Scanner and lens finder with the addition of detecting either wired or wireless signals. This extremely small device is used at all levels of law enforcement, including private investigation, Policing and for personal use, for people that demand to have privacy in their lives! On the back side of this detector, you will find a viewer with red LED lights that flash intermittently. Looking through the eyepiece, you can see anything that reflects light back to you. If there is a hidden wired or wireless spy camera, even the size of a tiny pinhole, it will reflect light back to you and you can easily locate the hidden camera source even if the camera is powered off!